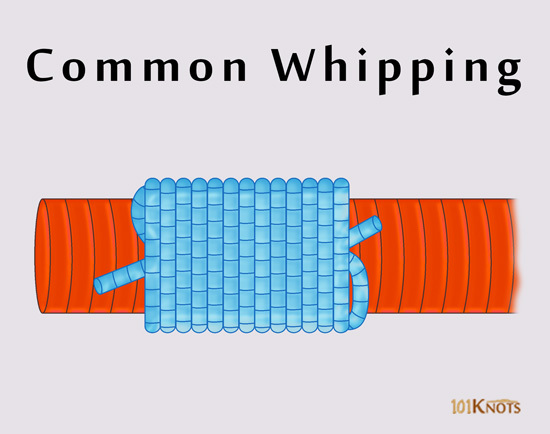 The basic of whipping techniques, the common whipping, prevents a rope from fraying, that is, unraveling into thinner fibers. It can also be used for securing objects together. It can be tied with twine or paracord. 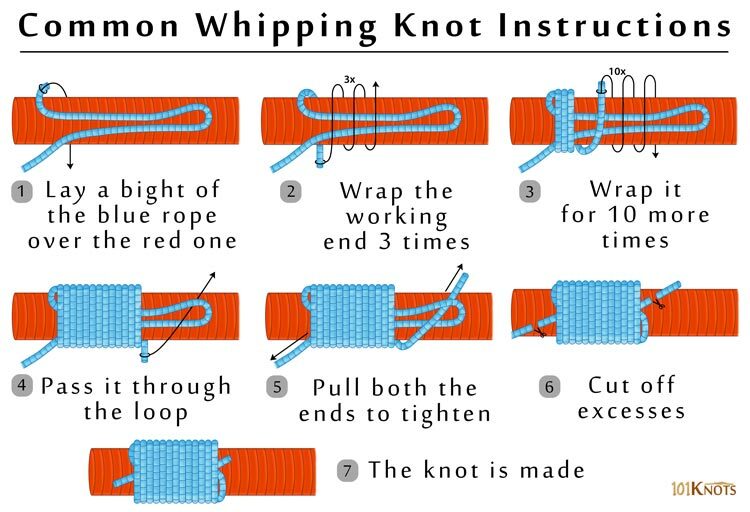 This technique is mentioned in The Ashley Book of Knots. It is also known as plain whipping, wolf whipping and ordinary whipping. It can be tied without using a needle or any tool. The thick red rope should be whipped at a short distance (about one and a half times its diameter) from its end. You can make as many turns to cover a length of the red rope that is about one and a half to two and a half times the rope diameter. The wraps should be made tightly keeping them close to each other. For maximum friction to hold the knot in its place, you should use natural twine on a natural fiber rope. Synthetic ropes can be melted by heat after cutting in step 6. While pulling on the standing end in step 5, take care to take the working end and bight only halfway underneath the whipping. If you pull it fully through by mistake, the knot comes undone. Hangman’s noose – It is a sliding loop knot that uses two bights of rope instead of one. In whip making. The knot is used to attach parts of a whip together. To make a loop at the end of a rope. To make sliding knot paracord bracelets.